Arrrr! We Old West bandits just love it here! 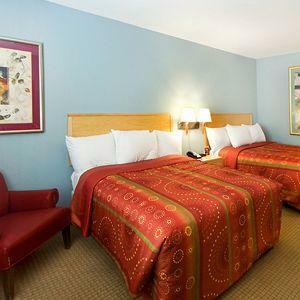 The rooms at Arizona Charlie's Decatur Casino Hotel are small and sparsely decorated but they're always clean. For some reason, they claim their rooms are "Northwest" themed, and as far as we can tell, they must mean the fabled Super 8s of the Northwest. To be true to its theme of Yukon con man AZ Charlie, we suggest dirt floors and straw-mat beds. We have no idea why the hotel didn't go for our master plan. The "Players" guest rooms at Arizona Charlie's Decatur Hotel and Casino are marginally better than the most basic room, but don't pay a lot more for them. The mini-suites are pretty ugly, but larger, have jacuzzi tubs, sitting areas, closed-off bedrooms and more space. If you're rich but have moderate tastes, go for the swank deluxe Penthouse suites. 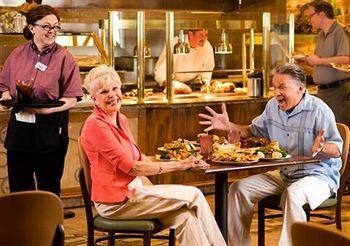 Arizona Charlie's Decatur Casino Hotel and Suites caters to blue-collar locals and seniors, and those folks usually don't demand a lot of attention so this is not a business hotel or a place to be pampered. 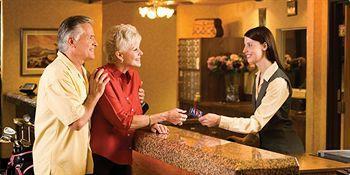 The staff we have dealt with are pleasant and friendly. Even to us. They give you the regular shampoo and soap freebies at Arizona Charlie's Decatur Hotel and Casino. It's not much so take the money you saved by not staying at one of them high-brow Strip places and buy your own toiletries. 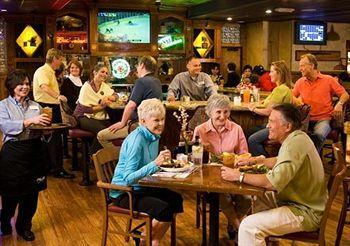 Lots and lots of seniors and blue-collar locals flock to Arizona Charlie's Decatur Las Vegas. This place is to the working man what Caesars Palace is to high-falutin' fat cats in tuxedos and fancy underwear. Unsurprisingly the pool at Arizona Charlie's Decatur Las Vegas is pretty plain. It's very small, but not heavily used, so there might be a chair for you. They even have a jacuzzi and they'll give you towels, but not to keep. Arizona Charlie's Decatur is not a hotel to stay at if you want all the glitz and glam that makes Vegas so famous, but if you're looking for cheap rooms and a fair casino, this is definitely worth the cash. 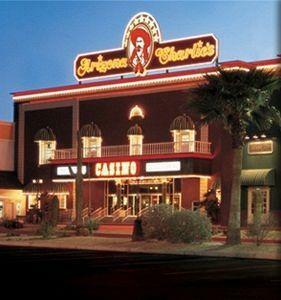 Arizona Charlie's Decatur Las Vegas has blackjack, some double deck games and other decent rules. Craps, roulette, Pai Gow. They also have bingo. Gosh, there are just so many ways to lose. Oh, they have a huge bingo hall, too, and, technically, it's played on a table. 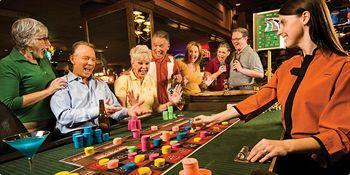 The craps game is $2 minimum at slow times with 5x odds. They have pretty low limits in the rest of the casino. Some $4 blackjack (yes, we double-checked, they have the only $4 games we've ever seen), $10 Pai Gow, and dollar roulette with a $4 minimum are available. A lot of video poker, with a a few full-pay, can be had. Plenty of old slots. Overall, a good selection for the nickel and quarter players. But for you high-rollers there is a salon with machines up to $5 a pop. Good. There's plenty of booze flowing in this joint, and maybe you can get your mouth around some of it. Just about anybody. You don't have to play much before they start in with the promotions. 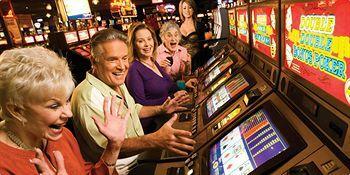 They do a lot of goofball stuff like giving free points and point multipliers to slot club members. The A.C.E. club is how you get your comps. 34, half of which are for sports. The rest are for the ponies and dogs. There is one big projection screen in the joint. About 75 decent, upholstered chairs. They have about thirty seats with individual TVs, but no free breakfast cereal. The seats do have individual desk lamps. Send the kiddies here to do homework. About eleven. Odds posted on white slate boards. Yes, in fact the waitress didn't even ask to see a bet stub. Maybe she figured we would bet once we got a little juice in our gullets. Not right in the book, but you can grab a sandwich at Subway nearby. Or, if you're a true gambler, try the Noble Roman's. In the book there are vending machines for ice cream bars and cigarettes. Everything you need to do a party right. Minimum bets are $5 for sports, $2 for races. This is a pretty small room, but it's okay. Still, don't come out here unless you want to feel small and just okay. Three tables, and we suspect they only have the second and third to keep the first from getting lonely. Pretty awful. They're covered in cloth, but not in great shape. Open, and moderately smoky and noisy. It's right smack dab between the pizza joint and the sports book. There's enough action in the nearby sports book to be a bit of a nuisance. There is a half wall surrounding it. That at least keeps out the children and very small dogs. Structured 4-8 Hold 'Em is the main game you can expect in this joint. They also claim to deal $1-$2 No Limit, but only at night. You won't find any classes here but there are some lovely electronic bingo games that are perfect for beginners, if real gambling isn't really your thing, that is. They don't get a ton of business, so it's rare that you have to wait for a seat, unless only one table is running. Free drinks while playing. $5 discount at their restaurants after three hours. These are locals who tend to play tight and the familiarity level is high. They have cheap tournaments some days. They got some swell cash bonuses for high hand and bad beat. Of course, you have to play both cards out of your own hand to win them. The three of a kind on the board never gets any respect. 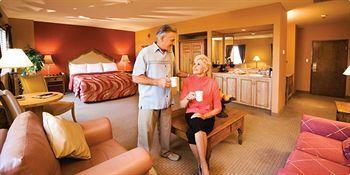 Standard Meadow Tower rooms are the ones in the original Arizona Charlie's Boulder Decatur Las Vegas. 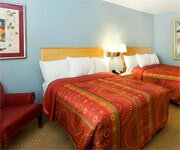 You get your choice of one king bed or two queen beds and each room is about 365 square feet. Arizona Charlie's Decatur Casino Hotel offers Internet, but there's a surcharge, so if you want to check your email, find a friend with a smart phone and save a few bucks. The Klondike Tower is the new tower at Arizona Charlie's Decatur Las Vegas which means it's slightly less dingy than the rest of the hotel. Each room here has two queen beds and is a rather modest 365 square feet big. High-speed Internet access is available for a surcharge. This tower steps outside of the box and has some non-smoking rooms available, too. Arizona Charlies is for gamblers! 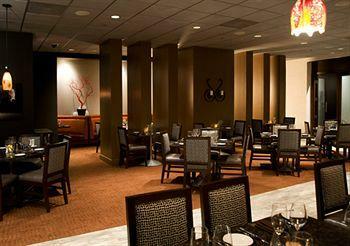 Like the title said, this review is for the casino and food only. Let me start off by saying everything that was stated in cheapos review is good, just lacking detail. If you ever get a chance to make it down to Arizona Charlies Decatur, you won’t be impressed by the interior. 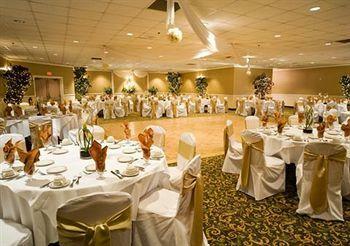 Setting is dark and casino has the typical smoky locals atmosphere. That said I LOVE THE TABLE GAMES HERE! 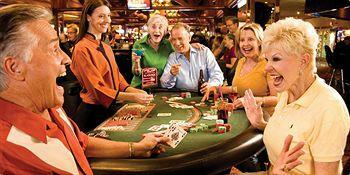 I am a craps player and this casino has some of the friendliest table staff in Las Vegas. Super low limits, ($2.00) and colorful characters at the tables. Im always pleasantly surprised that the tables have plenty of room for players. If they really wanted to get players onto the tables, they should open them early for “classes” as many players seem intimidated to join in. The craps table height seems a little high, when compared to Fremonts craps table. But still shorter than most strip casinos. That said, the craps table feels “lucky” here. Long rolls and the low limits keep the game enjoyable much longer. If your hungry, skip the food court and head to Sourdough café. Great specials (when you have the players card,) and the desserts are more than worth the price. Try the strawberry shortcake! The café always seems understaffed, but the workers make up for it with prompt and friendly service. Here’s a tip: NEVER get scrambled eggs here, it’s that fake bright yellow mush… Instead ask for scrambled hard, or sunny side up. The tables always seem a little dirty, but that’s part of the adventure… ^.^ If you sit up at the bar its always clean, and service is FAST! The buffet at Arizona Charlies is just alright. Most dishes attempted are southern in origin. The cooks seem to cater to the older retired crowd here. Not a bad thing, just don’t expect new and exciting dishes. All and all, Arizona Charlies is one of my favorite casinos to gamble in. If the café was a little cleaner, it would be a family favorite.